The Nouvo City Hotel offers guests a choice of two swimming pools to relax at: a rooftop swimming pool and a canal-side swimming pool. Our swimming pools use a natural salt-water purification system instead of harmful chemicals which provides cleaner and safer water for you and your loved ones to enjoy, even for those with more sensitive skin. From the roof-top near the swimming pool you may catch a glimpse of some local points of interest such as: the Rama VIII Bridge, Bangkok’s city skyline, old city Bangkok, Golden Mountain, and Banglamphu market. The Pool Bar offers visitors a menu of assorted drinks and snacks that may be enjoyed while basking in the sun. Offerings include burgers, fruit smoothies, sandwiches, and soft drinks. 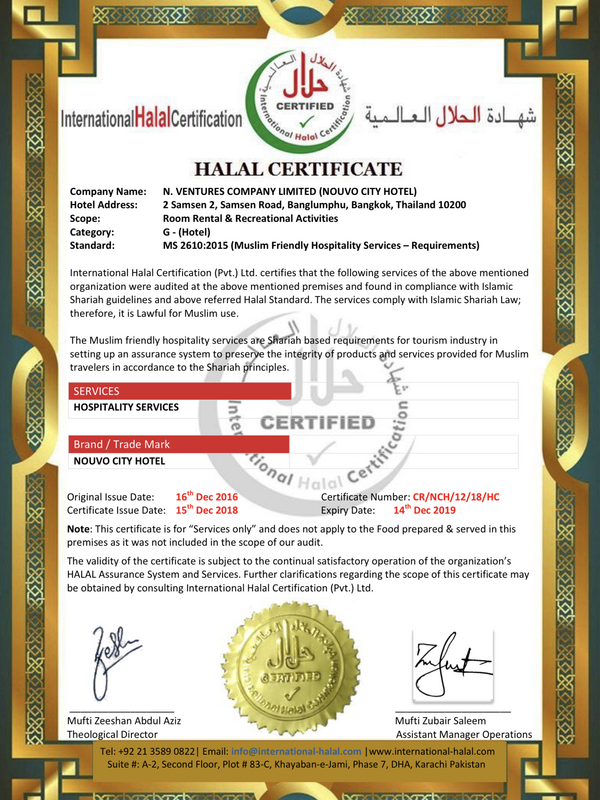 All beverages offered are Halal-certified and non-alcoholic. The canal-side pool is located on the 3rd floor of the Canal Wing with ease of access and a serene laid-back atmosphere. The swimming pools along with the Pool Bar may be enjoyed by guests of the Nouvo City Hotel daily from 8am until 8pm. The Sala Spa offers a variety of different spa and massage therapy treatments while offering a marvelous view of Bangkok’s old city. The Sala Spa greets guests at the roof-top entrance with its great pavilions and professional masseuses provide traditional therapies for everyone. A wide variety of treatments are available such as: facials, traditional massages, pedicures, manicures, hydro therapies, aroma therapies, herbal steams, and much more. Plus, all of our treatments are custom tailored for your unique skin with a handmade blend of Thai herbs. The Sala Spa uses only natural and local organic ingredients in its products to give your body nature’s best offerings. The Sala Spa is open daily from 10am until 8pm daily on the 8th floor roof-top area. The Body Design Fitness Center is fully-equipped with the latest in modern workout machines. Work up a sweat while enjoying a beautiful of old Bangkok while enjoying complete services, such as refreshing drinks and snacks from our Pool Bar. The workout equipment is the latest and state-of-the-art to offer guests the perfect exercise for all skill levels. Casually run on one of the treadmills while enjoying a book or go all out on the weight sets and lifting equipment. After a hard workout, head to our steam room to relax your muscles followed by a quick dip in the pool. The Body Design Fitness Center is open daily to all guests from 8:00 AM until 08:00 PM.